If the animated Shada doesn’t satisfy your appetite for Douglas Adams flavoured material, BBC Radio 4’s Commissioning Editor for Comedy, Sioned Wiliam, announced yesterday the return of Douglas Adams’ cult classic The Hitchhiker’s Guide To The Galaxy, as well as a brand new sci-fi series from Rob Grant and Andrew Marshall, The Quanderhorn Xperimentations. Both series are expected to air in 2018, but if that seems light years away there is a chance for a sneak preview at this year’s London Comic Con, where for the very first time Radio 4 will hold panels dedicated to each of these commissions. In 1978 the worlds of science fiction and comedy were united when BBC Radio broadcast The Hitchhiker’s Guide To The Galaxy by Douglas Adams, followed by four further series between 1980 and 2005. 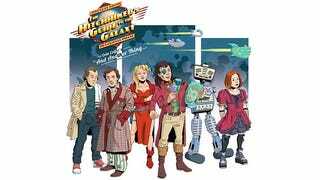 Now, for the 40th anniversary of Hitchhiker’s radio debut, the original radio cast will star in a sixth instalment titled The Hitchhiker’s Guide To The Galaxy: Hexagonal Phase. Produced by Dirk Maggs, chosen by Douglas Adams to bring Hitchhiker’s back to Radio 4 with the Tertiary, Quandary and Quintessential Phases, this series will be adapted from Eoin Colfer’s And Another Thing..., which was commissioned by the Douglas Adams Estate in 2009 to mark the 30th anniversary of the first novel. It will also include unpublished Hitchhiker’s material by Douglas Adams, sourced from notebooks and writings preserved in the library at St. John’s College in Cambridge. Across six episodes, Simon Jones will reprise his role as the main protagonist, the quintessentially English Arthur Dent, as he continues to travel through space and time following the destruction of Earth. Starring alongside Simon will be members of the classic radio, television and stage casts, including Geoff McGivern as Ford Prefect, Mark Wing-Davey as Zaphod Beeblebrox and Sandra Dickinson as Trillian, as well as special guest stars including Jane Horrocks as Fenchurch. Following in the footsteps of the late Peter Jones and William Franklyn, Douglas Adams’ friend, co-author and former flatmate John Lloyd will step into the the voice of The Book. “It seems extraordinary that it’s been forty years since we recorded the first pilot episode for BBC Radio,” said Simon Jones. “How modest were our expectations then, and how amazing a world-wide phenomenon it became, and continues to be. I never expected to still be searching for a decent cup of tea and some kind of answer to Life, the Universe and Everything almost a lifetime later. Still, the dressing-gown and towel may be a little threadbare, like my hair, but my voice, much to my surprise, hasn’t changed a decibel, and despite years in America, I can still talk Arthur’s ‘indignant-posh’. The Quanderhorn Xperimentations is a new six-part series from Rob Grant, Red Dwarf co-creator, and Andrew Marshall, 2point4 Children and The Burkiss Way creator, which promises adventure, thrills, romance, and mind-warping technology. It’s 1952. Permanently. Reality is trapped in a time loop by Professor Darius Quanderhorn’s bizarre Xperimentations His rag-tag team face threats and terrors beyond human understanding on a daily basis, together with their own neuroses. Martian invasions, giant space lasers, shape-shifting troglodytes and living feral underwear are all part of a day’s work for the Quanderteam: Dr. Gemini Janussen has clockwork-driven emotions, Guuuurk the Magnificent is a Martian hostage who fancies himself a gentleman cad, Troy, the professor’s “son”, who is part human, part insect, all idiot, and Brian Nylon, who has completely forgotten that he is the unit’s Test Pilot. In fact, he has completely forgotten who he is at all, but what he is finding out is beginning to disturb him. Meanwhile, as the Professor ploughs ahead with his dangerous and sinister creations, oblivious to the consequences, his arch-nemesis, Prime Minister Winston Churchill, has begun to resent the public adulation of this reckless genius and would like to shut down his operation for good. But dare he do that, and risk unleashing the terrible secret lurking in Quanderhorn’s cellar? In celebration of the new commissions, Radio 4 will make its first outing at MCM London Comic Con this autumn, with a Hitchhiker’s panel, comprised of stalwarts Simon Jones, John Lloyd and Dirk Maggs, on Saturday 28th October, and a panel with sci-fi and comedy masterminds Andrew Marshall, Rob Grant and The Quanderhorn Xperimentations’ producer Gordon Kennedy on Sunday 29th October. Both series are expected to be broadcast on BBC Radio 4 in spring 2018, with archive series of The Hitchhiker’s Guide to the Galaxy to be broadcast on BBC Radio 4 Extra to tie in with the new adventure.